T*K*O - "The Moppet Family"
Discussion in 'Friends and Family' started by D'Snowth, Feb 4, 2006. Based on the “The Moppet Family” Created By: Beauregard. 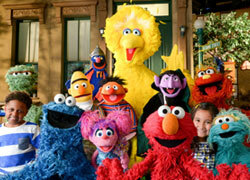 Special Muppet Guest Appearances by: A Cast of Several! The thread killers were in the conference room, as MrsPepper was giving a special quarterly conference. MRSPEPPER: …And further more, your pay will be calculated in a new fashion after this quarter, so be expecting slightly different checks next quarter. Now then, we turn the floor over to chief thread killer, Vic Romano! VIC ROMANO: Thank you MrsPepper. Fellow thread killers; as MrsPepper announced, later this week marks the end of this quarter, I would like to announce that that same day, the thread killers will be putting on a special company play on the roof. As the thread killers murmured happily and nodded each other, MrsPepper folded her arms. VIC ROMANO: Rehearsals we will begin tomorrow afternoon with the president’s permission. MRSPEPPER: (Interrupting) Excuse me Vic, but what’s on the program? VIC ROMANO: Oh, I gave them the choice of: Romeo and Juliet, Hamlet, or Macbeth. MRSPEPPER: (Crosses legs) …and they chose…? VIC ROMANO: The Moppet Family! MRSPEPPER: (Interrupting) Yes, yes, I’ve seen it, I’ve seen it. BEAUREGARD: (Strolling by in the hallway) Oh that’s a cool show! I especially like that handsome guy that plays the father! MRSPEPPER: Well Vic, I must say this does sound rather interesting, AND I’m sure that not only will this offer a twist on the plot, but I’m sure it’ll boost up our ratings as well! THEPRAWNCRACKER: Here, check out the guest list! BEAUREGARD: (Peeps through the door) Yes MrsPepper? MRSPEPPER: (Back to the list) You even invited my husband, Floyd?! THEPRAWNCRACKER: That was Snowthergeist’s idea! MRSPEPPER: Okay now Vic, I won’t stand in the way of this, go ahead and continue please! VIC ROMANO: Oh, and I would like to announce that I’ve managed to get Father from the real show to play himself as a celebrity cameo! BEAUREGARD: (Pops head through door) Ooh, maybe I can get his autograph! MRSPEPPER: Do you really think we can afford this with our budget? VIC ROMANO: No, that’s why I told him this would be a “benefit” performance. MRSPEPPER: That’s dishonest! (Stands up from chair) Guys, listen, the next time you all want to do company plays and special things like this, always let ME handle everything! After days of practicing and rehearsing, the day of the play finally came. Up on the roof of the 3976th ½, D’Snowth had a section of bleachers set up for the audience. 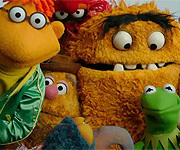 Everyone in the audience was Muppets from previous episodes of the show. Even Floyd Pepper had a special box seat (which is literally a box) since he’s the president’s husband. Before the play went on, some Muppets, and Beauregard were getting autographs from Father Moppet. After a few more minutes, the curtains open on a black stage. The lighting slowly rises to reveal two empty chairs set next to a round wooden table. Behind, is a set up of a messy counter and a line of smoke rises from a toaster. The stage is empty. There is a crash, and Father dashes on stage, half tripping, and slides onto one of the seats in one heck of a hurry. Naturally, he should been there for the curtain. FATHER: Er (Coughs) Tea, toast, family, what a fabulous thing it is to be the father of the family surname Moppet, great wife, nice kids. (Frowns) What am I, Mr. Cole? Well, ahem, Vic! VIC!!! Where are you? Get down here! It’s 7:30!!! (Looks at watch) Actually…it’s 7:43am American Central time, but that’s beside the point…VIC!!! TOGETHERAGAIN: The kittens aren’t born yet, right? THEPRAWNCRACKER: Who is Jack? That should work for a distraction. D’SNOWTH: Jack? Oh! Jack! Quick, hand me that white shirt! FATHER: (Wiping sweat) Victor Moppet! Your mother specially burnt…CRISPED…this toast for you! Get out, down, here and eat it! Or I swear I will ground you to the second act! JACK/D’SNOWTH: (Enters) Never fear, Jack Bandit is here! I’m the totally un-criminal brother of the nanny you called for. FATHER: Nanny? Jack? I… Vic! I think we just skipped the first act! You are ungrounded! Get out here! THEPRAWNCRACKER: Vibs, we need a baby. VIBS: I beg your pardon? We only met a few episodes ago! FATHER: So, um…Jack…what is your occupation? Do you like toast? JACK/D’SNOWTH: I love toast. And I really love (Stops) VIBS!? VIBS/BABY VIBS: (In cute baby-suit and hair in three bunches) Hello Jack’k’yyy! FATHER: Vibs! Ahh, there you are! Have you seen your (Hint) brother? VIBS/BABY VIBS: I’ll go check! VIBS/BABY VIBS: Oh! I won’t go check! I’ll…take a rain check on checking! JACK/D’SNOWTH: I’ll be right back! MRSPEPPER: This is going well. MRSPEPPER: Too much fur! We can’t make a suit that fast! D’SNOWTH: (Running offstage, tripping on painted long white shirt) We need Dog! VIC ROMANO: (In dog suit) Never fear Vic is here! (Steps onstage to thunderous applause) Aref arf!!! Woof arffy! This is harder than I thought…and hotter in this suit…oops! Arfbarkfff!!! FATHER: (Gulp) Here, um, eat this toast. VIC ROMANO/DOG: Af! Is that the only arfing gag around here? VIBS/BABY VIBS: This is culture! I mean, I was so not born in this episode. THEPRAWNCRACKER: Ahh! Mr. Cole! That’s my cue! Meanwhile, onstage there was an explosion of smoke. As ThePrawnCracker appeared as Mr. Cole. THEPRAWNCRACKER/MR. COLE: You know I am loathing interfering in the affairs of others..
FATHER: Affairs? MopFam is a children’s show! We don’t do things like that! This isn’t a cheap soap! D’SNOWTH/MOTHER: (Hurrying onstage) Hello dear. FATHER: This is wrong on so many levels. D’SNOWTH/MOTHER: Do I smell burnt toast? FATHER: Mother, Dan Dan will be arriving later, right? Everyone gathered around offstage, including Father. FATHER: Do I get paid double for this? VIC ROMANO: What? You didn’t do this for the joy of appearing in our play? FATHER: Let’s get this scene straight before we start. PrawnCracker, you be Captain Hevej. TogetherAgain, we’ll need a Miss Mingstone. We need Fairy-Godmother. MrsPepper? MRSPEPPER: I am the producer. FATHER: Perfect, you’ll do fine. D’Snowth, who are you again? D’SNOWTH: Doesn’t the face-painted blue skin and the mono brow give it away? FATHER: Mother isn’t in this scene. MRSPEPPER/FAIRY-GODMOTHER: Is this old English? VIBS/MR. HARVEY: English, check. Old, no. VIC ROMANO/DOG: Arffy joker olderf! FATHER: And the joke was old, too. D’SNOWTH/DAN-DAN: Did I mention that my pet mop’s favorite uncle ate a haystack last night? Holy mosquitoes, I laughed straight through the whole thing! AWESOME! And again, I say that this is the most awesome fabulous T*K*O ever!!! I loved it and cannot wait for next season!! Wah-ho! Good season ender Sneeblerz! This is definately one of the best! 5 Thumbs up! ...and don't forget, Beauregard will make the extended un-cut version of the play (with a cameo appearance by TA) available soon! This was awesome. There are so many great lines in this one, it's not even funny. Well, it is, but it's so funny that it's actually not that funny at all. Or something. FATHER: [....] We need Fairy-Godmother. MrsPepper? FATHER: Perfect, you’ll do fine. Gah I could go on forever! >< D'Snowth, you get a gold star. And a bonus. And I'll buy you a ficus plant for your office. D'Snowth, you get a gold star. And a bonus. And I'll buy you a ficus plant for your office. ANOTHER gold star?! I feel so...special! A bonus?! Me?! Aw shucks, oh, and just what I always wanted: a ficus!!! Oh, and guys, don't forget to credit Beau, after all he actual wrote most of this episode (the play part), while I just wrote the first sequence. Oh, and I made the announcement about season 3, so you might want to check that out, now if you'll excuse me, I have another ace up my sleeve on how to celebrate at the T*K*O wrap party! Yes, Beau! Of course. Major snaps to you! You get... ah, you get a raise. now if you'll excuse me, I have another ace up my sleeve on how to celebrate at the T*K*O wrap party! This ace you speak of... it doesn't involve punch, does it? Don't worry, boss- if it does, I've been practicing a punch of my own... of the "line" kind. Actually no, and uh...why are you all looking at me like that?! That's good, Toga, but maybe you ought to practice another sort of punch, in case THIS one **gives a Look to D'Snowth** gets himself INTO the punch. I have another ace up my sleeve on how to celebrate at the T*K*O wrap party! Never mind, it keeps screwing up! Edit: Pepper, Snowthie ziffled me!!! I just have to comment on how much I love this episode! I do read this pretty regularly, but don't usually say anything, but this was so awesome! Really, really great! Jim: That was a great season finale. So much comedy gold there, wonder if I can steal some of that for a bear friend... Did I say steal??? Never mind. Will definitely raise their budgets all around, they deserve it. *Makes phone call and picks up T*K*O* for another two seasons. This was the greatest one of all D'Snowthplow and Bo-Re-Mi-Guard. This was funny, I was just finally starting to read a little bit of The Moppet Family yesterday to prepare for this, and I can't wait for the "Extended Cut" or the play. *Makes phone call and picks up T*K*O* for another two seasons. IT IS AWESOME! IT IS AWWESOME! IT IS...CUT!!! Ok, so, seriously, the introduceing scenes were some of the best I have seen in TKO!!! And the play was fabulous! But I did notice some significant cuts there! I do have plans for bringing an uncut (or less cut) version to light in a MopFam capacity (hint: a long needed update for the site maybe).